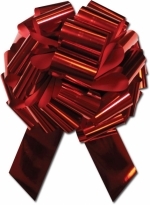 Windshield pull bows conveniently tie to included suction cups for easy attachment to windshield glass. Simply pull the string and a bow is cdreated. Bows are designed to be used either indoors or outdoors. Weather resistant construction. Available in Metallic Red. Bows are sold 10 Bows to a box.